In the heart of the English countryside, Springhill Farms makes the very most of agricultural waste. Upgraded biogas is injected into the national gas grid, while the carbon dioxide (CO2) by-product goes straight to the farms’ tomato greenhouses. The gas produced during anaerobic digestion consists roughly of 60 percent methane and 40 percent CO2. Until recently, biogas from anaerobic digestion was only used for local heating or power generation, but a much more economic yield is gained by upgrading biogas to biomethane (biogas with the specifications of natural gas). Upgrading technology turns raw biogas into biomethane by removing impurities and CO2. The next step to commercial viability is bringing this gas to the grid. While this business model is becoming more attractive, it is not straightforward. The best investment decision depends on the volume and characteristics of the feedstock, the national legislation, and the right technology. As the expertise and technology matures, the days of pioneering enthusiasts and farmyard experiments are over. By opting for Pentair Haffmans’ combination of membrane and cryogenic technology, Springhill Farms has leapt beyond the tight margins of traditional biomethane production. The Vale of Evesham in Worcestershire, situated in the River Avon basin, is known as Great Britain’s ‘fruit and vegetable basket’. One of the region’s main producers, Evesham Vale Growers, needed to find a solution to a mounting waste problem and the rising costs of power and heating. Due to new legislation, the waste from 2,000 acres of farmland and 30 acres of glasshouses at Springhill Farms could no longer be returned to the land as fertilizer. The construction of an anaerobic digester plant combined with biogas upgrading and grid injection as well as CO2 recovery, has created a win-win situation. “It has been a long way to achieve the best solution, but in the end we have succeeded in creating a farm that produces food and energy on an economically and environmentally sustainable basis and can serve as an example of the farming of the future,“ said Matt Powell, Director of Springhill Farms. Pentair Haffmans’ two-step approach results in a higher methane yield and allows for recovery of pure CO2. At Springhill Farms, the liquid CO2 is produced during the night and used in the daytime as a gaseous natural fertilizer in the farms’ greenhouses. The system configuration enables precise CO2 dosing based on a set timetable that assures optimal plant growth and a 15 percent higher tomato output. While Springhill Farms uses the produced CO2 for internal purposes, other plant operators sell the liquid CO2 and generate an additional source of income. Since August 2013, Springhill Farms has delivered biomethane to the Wales and West Utilities gas grid. At full capacity, the system produces 225 Nm3/h of biomethane 24/7, which is enough to supply 1,000 households with their annual natural gas consumption. Springhill Farms uses 25 percent of the gas produced to meet its own heating and power needs. Having met its original goal of energy self-sufficiency and waste processing, the farm has diversified, and Vale Green Energy has new plans for sustainable local energy production. 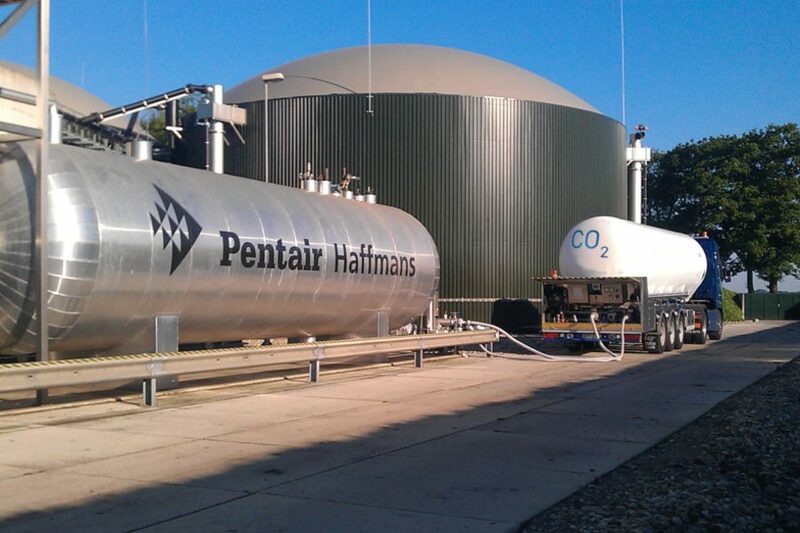 Pentair Haffmans’ advanced biogas upgrading technology has substantial advantages compared to conventional systems with zero methane slip and CO2 as additional revenue stream. 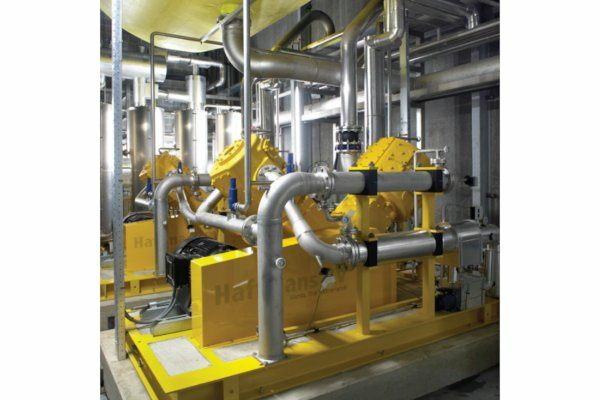 As CO2 Recovery Specialist Haffmans offers CO2 storage vessels up to complete CO2 Recovery Plants.